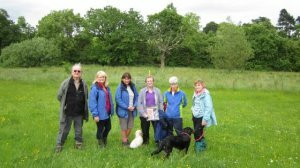 This group meet every month to enjoy a walk with a different leader. New members are always welcome on our walks. You do need to be able to walk 4-5 miles on an afternoon walk or 7-8 miles on a day walk and to wear proper walking footwear. Well behaved dogs only are welcome under the supervision of the owner and to be on the lead where there is livestock or nesting birds. Please check with the leader that dogs are allowed across any access land. Disclaimer. Members are reminded that participation in walks is at their own risk, and that the leader(s) accepts no liability for any loss or injury, however caused.